Designed for 1280 x 1024. At 800 x 600, view full screen. 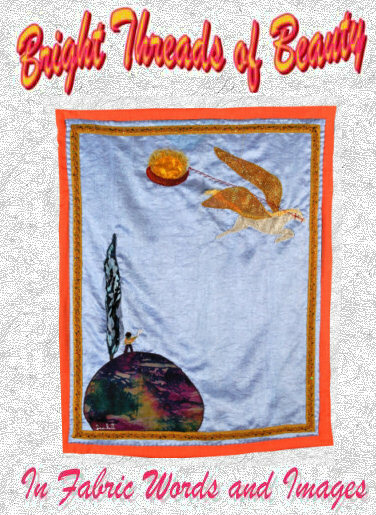 Welcome to my website which is about my art, my creative stitchery in the form of rich and colourful wall hangings, fabric sculptures, and some of the prose and poetry which has surfaced over the years from my deep probings into Nature and the mysteries of life. My wall hangings have a three dimensional feel to them, and cover a wide variety of expression; I am told they often move people very deeply. Perhaps this is because I work with beauty, with loveliness, and these archetypal qualities are so potent in themselves that, like poetry or music, they may heal and refresh the soul. It has also been said that they contain an elusive presence that speaks very directly to the unconscious, encouraging the viewer to participate and find a response within themselves that resonates to the image. Please bear in mind as you look at my work that these are not static images: they move and change with the light, and people who have lived with them tell me that the process of under-standing what they contain grows and evolves over time, so the photographs you will find here can never really represent them very well because each snapshot captures just one of their faces or moods, but, nonetheless, I hope the site will give some understanding of my work and that you will enjoy looking round. Landscapes, often inspired by the magically soft beauty of the willow strewn marshlands of south west England and the stunning contrast of the sun baked Tuscan hills embroidered with gentle grey silver of the olive and dark stern green of the watchful cypress. Velvet mountains, sparkling water studded with sequins and beads, rough sacking tree trunks and silken leaves. Archetypal Images expressing different attitudes and characteristics of the human person-ality. Goddesses of love and healing, Mothers Mary, warriors, angels, dancing figures, youth and old age, the signs of the zodiac and the planets. Images for Children. I love making images for children, sometimes for a birth or a baptism, sometimes an image of an angel or magical creature to accompany a child through its first years from the wall of the bedroom. I like to work with the childs astrological chart as a source of inspiration. In this way it is completely and uniquely personal to that child. Astrological Images inspired by a persons birth chart. These can take the form of a scene or a single figure and people have told me of the emotion they felt and the sense of deja vu that came over them as they recognised deep and unspoken qualities hidden within the folds. Amongst my writings is a study of the Natural Elements as a mirror for the human soul that I have undertaken with great interest for many years.